6889 140I 20 Pfg. 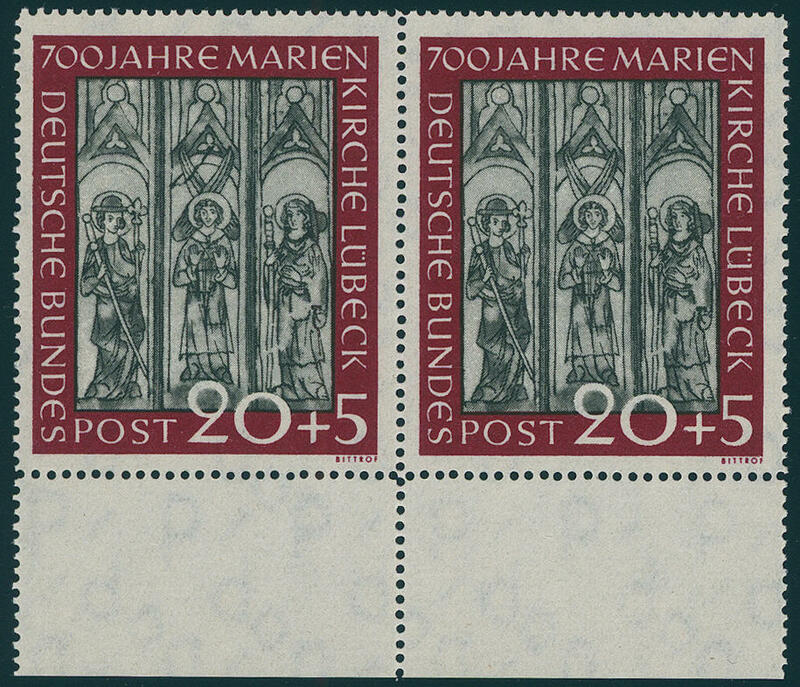 St. MaryÂ´s Church with plate flaw \"crack in the middle FRESCO over figure\" in the horizontal pair from lower margin, unfolded and in perfect condition mint never hinged photo expertize \"the quality is perfect\" Hans-Dieter Schlegel BPP. Michel 760,- €. 6890 140I 20 Pfg. 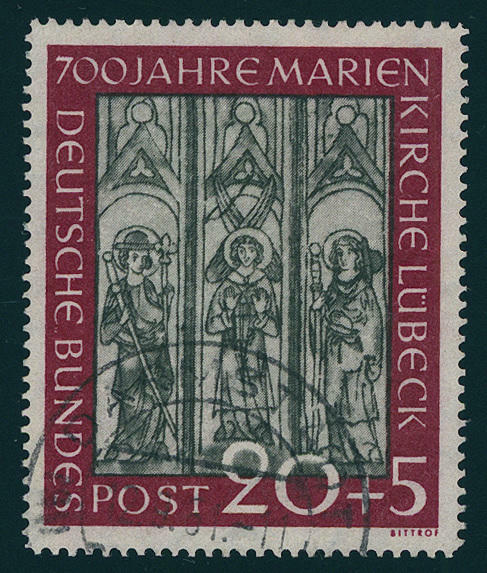 St. MaryÂ´s Church with plate flaw \"crack in the middle fresco over figure\", fresh colors and very well perforated from lower margin, unfolded, in perfect condition mint never hinged, twice signed Schlegel BPP. Michel 650,- €. 6891 ⊙ 140I 20 Pfg. 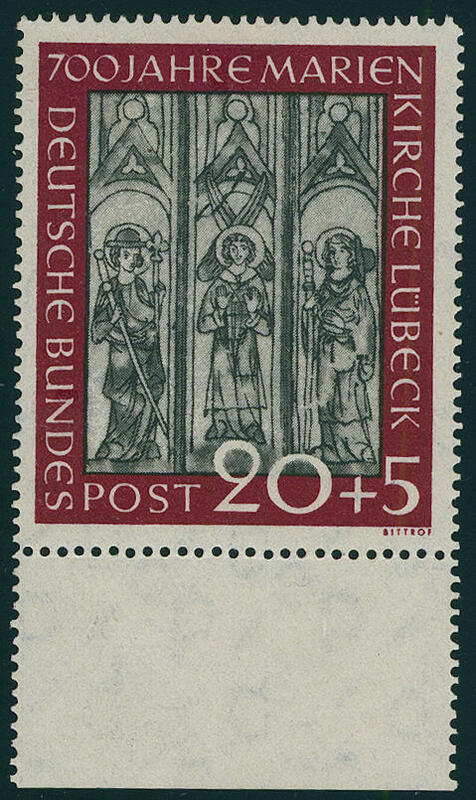 St. MaryÂ´s Church with plate flaw \"crack in the middle fresco over figure\", fresh colors and very well perforated, neat cancelled \"DARMSTADT 12.9.51. \". Michel 400,- €. 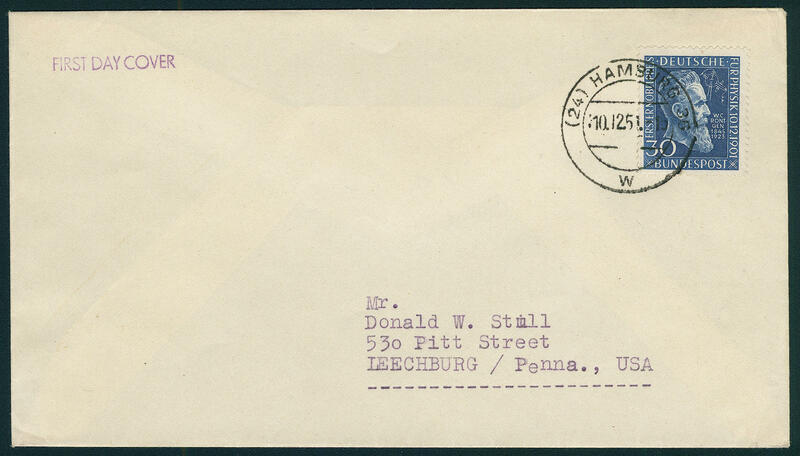 6893 FDC 141/42 Wuppertal series 1951 on decorative, correctly franked First Day Cover with first day special cancel \"WUPPERTAL-ELBERFELD 14.9.51. \" to Basle / Switzerland. Michel 300,- €. 6894 FDC 143/46 Welfare 1951, the complete set fresh colors and in perfect condition on very decorative registered First Day Cover from \"LORCH 23.10.51. 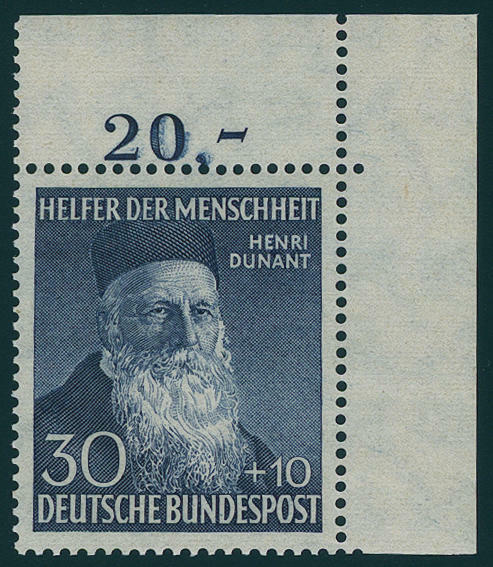 \" to Landeck / Emmendingen with arrival postmark. Rare! 6895 143Pa 4 Pfg. 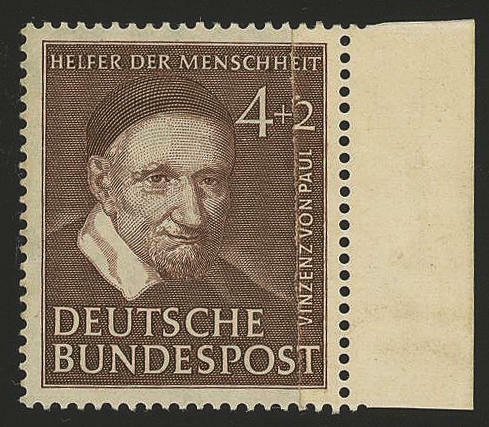 Welfare 1951 with very rare variety \"glued paper web\" from right margin of sheet, fresh colors and in perfect condition mint never hinged there are very few examples from this known, the to the rarities of the Federal Republic count. By Michel fully undervalued! Photo expertize Schlegel BPP. 6896 146 30 Pfg. 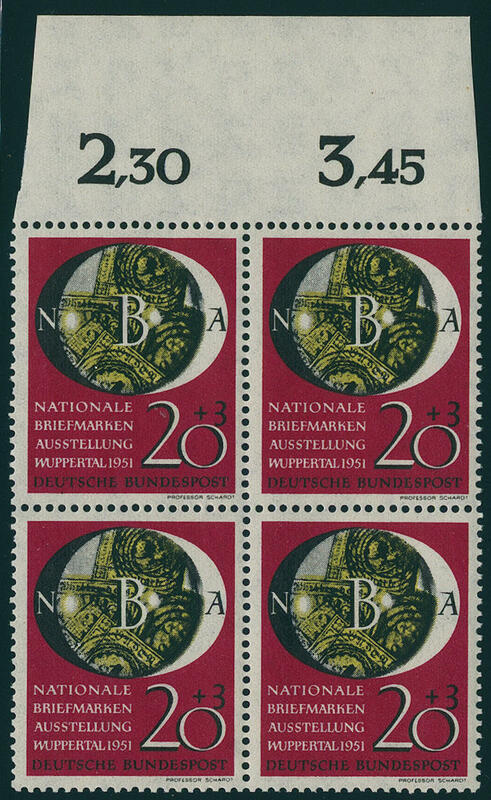 Welfare 1951, block of four from the left lower corner of the sheet (at the bottom no perforations going through margins), fresh colors and in perfect condition mint never hinged, unfolded, without any signs. 6897 ∆ 146 30 Pfg. 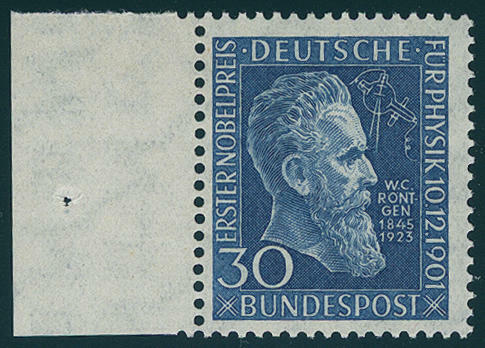 Welfare 1951, in perfect condition on white letter piece, very nice canceled \"KARLSRUHE 19.11.52. \". 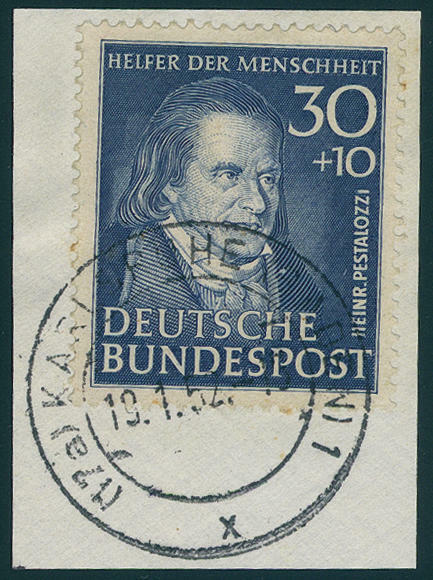 6898 FDC 147 30 Pfg. 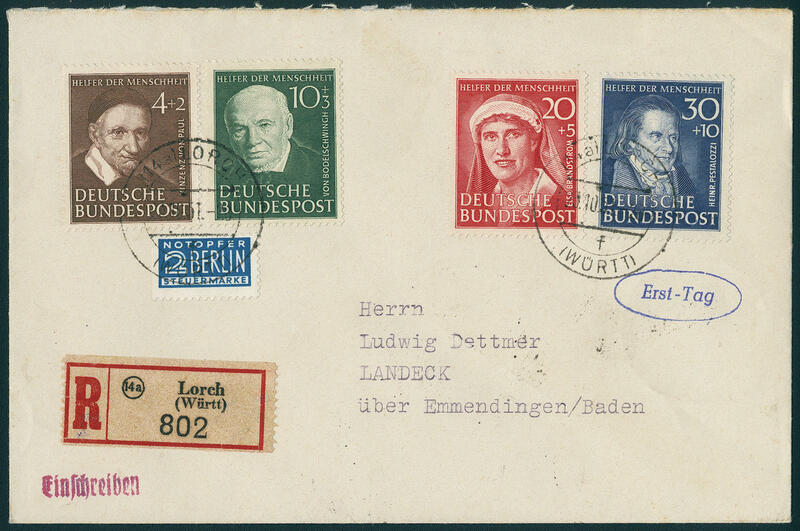 Röntgen 1951, in perfect condition on very nice correctly franked First Day Cover from \"Hamburg 10.12.51. \" to the United States, photo expertize Schlegel BPP. Michel 500,- €. 6899 147Z 30 Pfg. 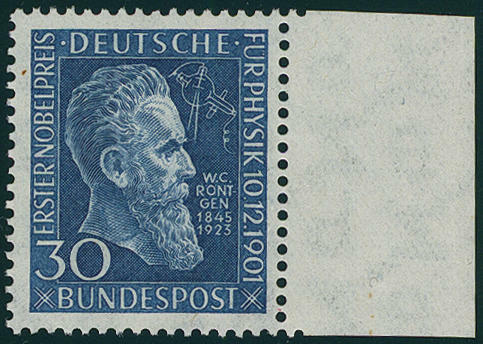 Röntgen 1951 with watermark-variety 4 Z from left margin of sheet, unfolded, in perfect condition mint never hinged, expertized Schlegel BPP. Michel 320,- €. 6900 147Z 30 Pfg. 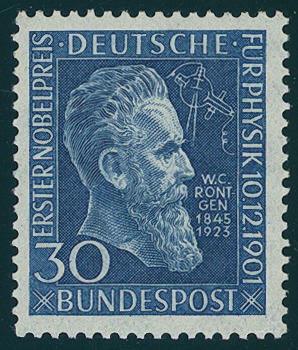 Röntgen 1951 with scarce watermark 4 Z in lieu of 4 W, in perfect condition mint never hinged, twice signed Schlegel BPP. Michel 320,- €. 6901 147Z 30 Pfg. 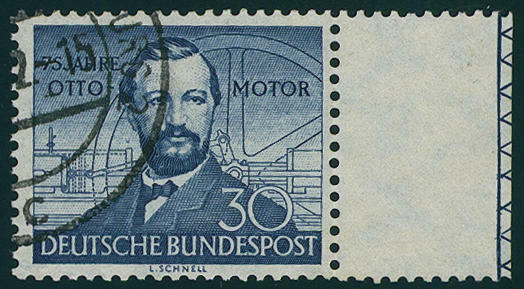 Röntgen with watermark-variety \"4 Z\" from right margin of sheet, in perfect condition mint never hinged, expertized Schlegel BPP. Michel 320,- €. 6902 150U 30 Pfg. Otto engine 1952, four sides unperforated, fresh colors and in perfect condition mint never hinged, a very scarce variety! Photo expertize \"the quality is perfect\" Hans-Dieter Schlegel BPP. 6903 150Z 30 Pfg. 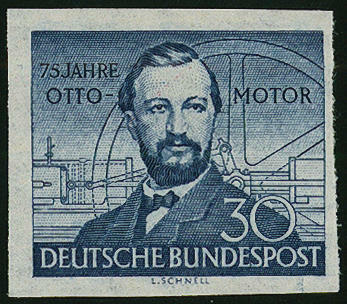 Otto engine 1952 with very scarce watermark 4 Z in lieu of 4 W, fresh colors and very well perforated, from lower margin, in perfect condition mint never hinged (also in the margin of sheet), without any signs. Photo expertize \"the condition is perfect\" Schlegel BPP. 6904 ⊙ 150Z 30 Pfg. 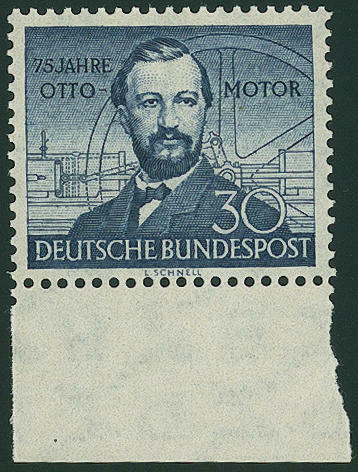 Otto engine 1952 with rare watermark-variety \"4 Z in lieu of 4 W\", fresh colors and very well perforated from right margin of sheet with Farbkontrollstreifen, neat cancelled from this watermark variety are in used condition anyway only a few copies became known. 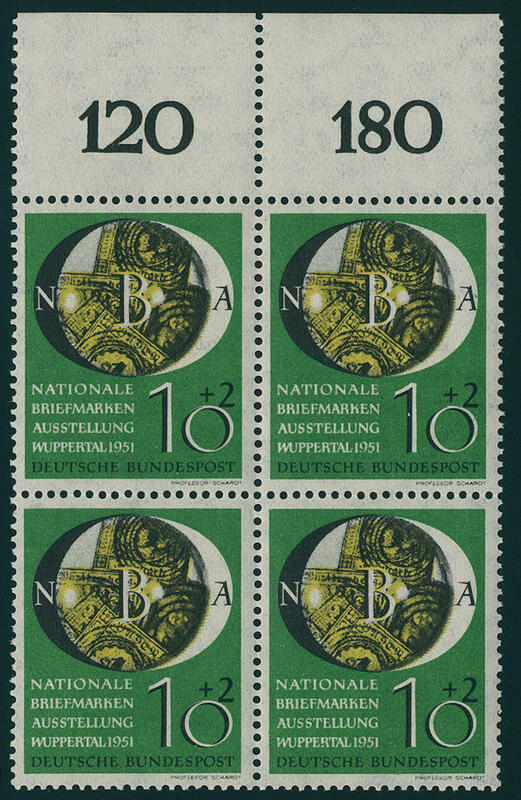 Associated with Farbkontrollstreifen a Federal Republic rarity! Photo expertize \"the quality is perfect\" Hans-Dieter Schlegel BPP. 6905 ✉ 154 20 Pfg. 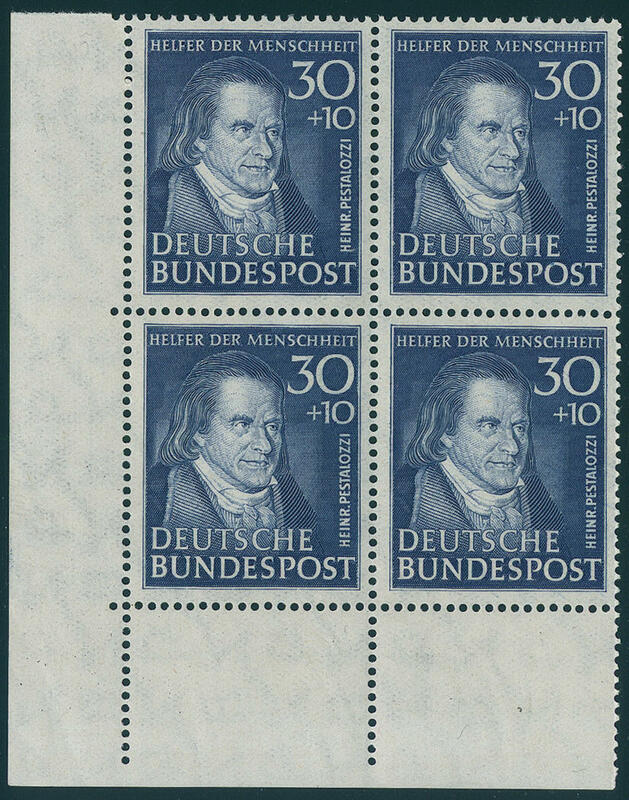 Youth 1952 with additional franking Berlin Beethoven in the horizontal pair on very nice air mail letter from \"Hamburg airport 19.4.53. 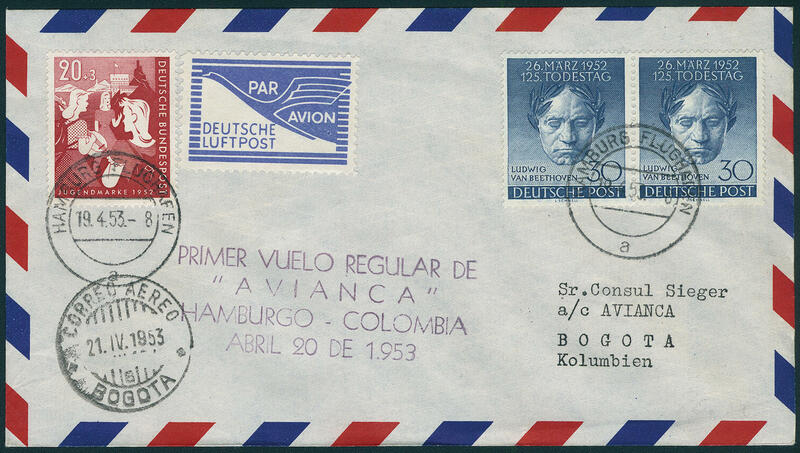 \" as first flight to Bogota / Colombia with transit and arrival postmarks. 6906 155Ul 20 Pfg. 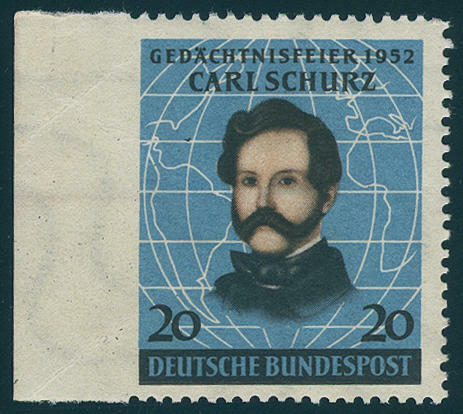 Schurz 1952, left unperforated from left margin of sheet, fresh colors and well perforated, on the back adherence trace, minimal creasely. A scarce variety! 6907 159 30 Pfg. Welfare 1952, right upper corner of the sheet, unfolded, in perfect condition mint never hinged, without any signs. 6908 ✉ 159 30 Pfg. 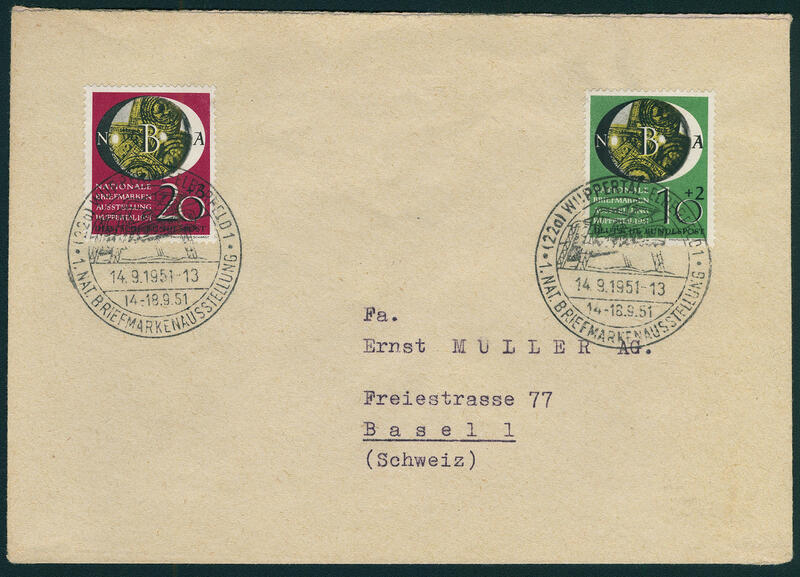 Welfare 1952 with good additional franking on very nice registered air mail letter from \"FRANKFURT 1.3.53. 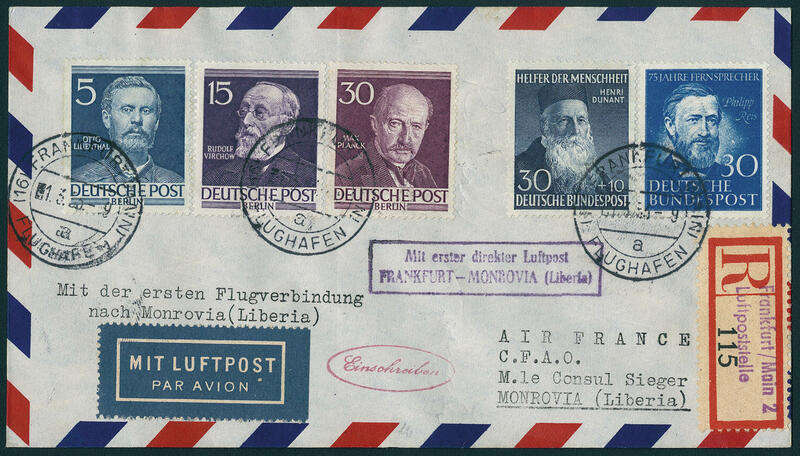 \" with additional rectangle cancel \"with first direct airmail FRANKFURT-MONROVIA (LIBERIA) \" with transit and arrival postmarks. Very decorative!